form for the first time in 1951. There are very few commercial applications for curium, but in the future it may be useful in radioisotope thermoelectric generators. 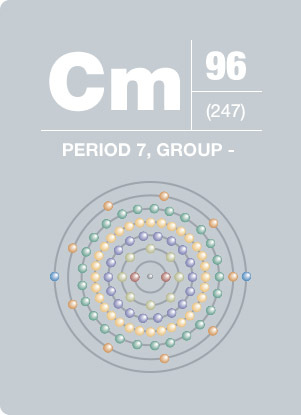 The isotope curium-242 can generate about 2 watts of thermal energy per gram and is used in pacemakers, remote navigational buoys, and in space missions. If curium enters the body it can be very destructive because it accumulates in bone tissue, which then destroys bone marrow and stops red cell formation. The element is named after the spouses Marie and Pierre Currie, who are recognized for discovering radium.